It’s a Georgetown Ant Attack! 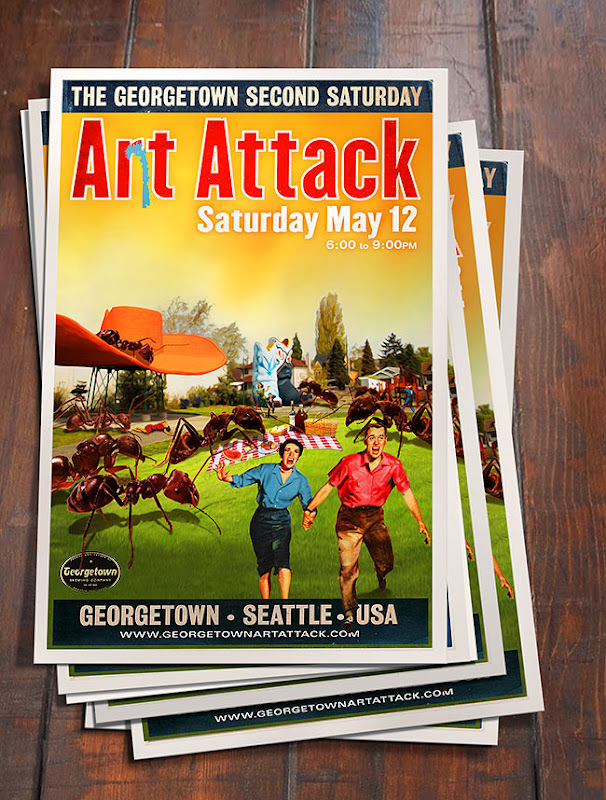 Because of top-secret atomic tests at Boeing Field, common ants have mutated into giant monsters! Remember to be aware of your surroundings when visiting Oxbow Park, the ominous beasts have already ruined several picnics. They seem to be partial to good beer and potato chips. (Bottom) NIGHT OF THE LIVING ELVIS at the Georgetown Trailer Park Mall. By April 14th, we know April Showers and leftover egg salad leaves Seattlites feeling a little like that chocolate bunny with its ears bitten off. 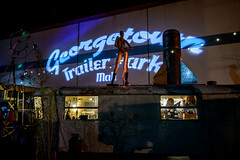 Georgetown has just the cure! 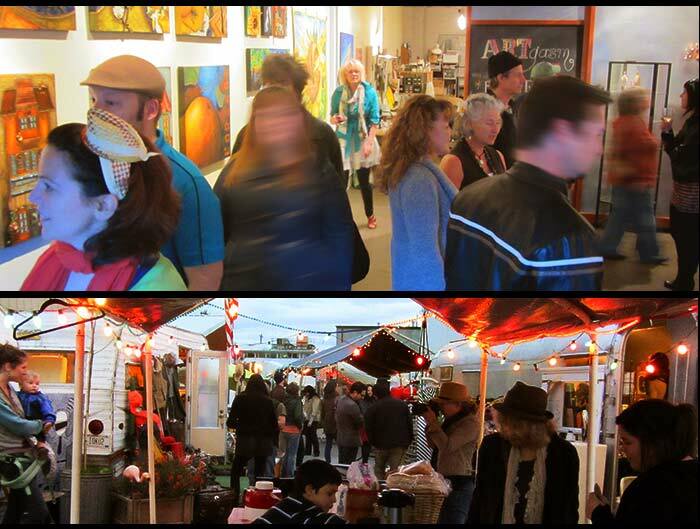 Our Art Walk is a delight of music, visual art and culinary feasting, guaranteed to rinse away the taste of Peeps and Doldrums. Too rainy or cold to walk? No fear, our new Art Bus is just minutes away to transport you up and down the Airport Way Corridor – just look for the Bus signs! American Pie presents the “Eastern Egg” by Tobi Nussbaum, featuring photographs of her original painted eggs. Bella Vitale: Resident artist Angielena will be relocating Bella Vitale studio in late April and this will be your last chance to get a good deal on her unique woodblocks and paintings. Please come show your support for this longtime Georgetown Artist by purchasing or donating a kind word to her. Libations will be provided. Calamity Jane’s will showcase the sculptural Zen-style stone and wood assemblage work of James C.Bassett. A Dog’s Dream will host the work of Brittany Both. The Equinox features the following open studios: Sherry and Steve Hussey of Iron Idiom, Reno Buchstaber of Bombshell Shirts, painter Melinda Hannigan, carpenter Dan Morgan, The 1979 Bizarre, M. Anne Sweet of Studio Six Eight, Lisa Geersten and Andy Blakney of Firelight Forge, John Kirschenbaum, Sara D. Woodson of Downing Pottery, Tamara Clammer of fadeOdd Masks, and more! Fantagraphics Bookstore & Gallery presents Joe Simon and Jack Kirby’s “Young Romance”. Opening reception and discussion by curator Michel Gagne. FruitCocktail features vintage Northwest Art. 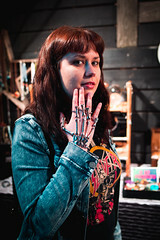 Georgetown Arts and Cultural Center hosts an all-resident open studio extravaganza. Come see the talented and amazing works of the nine resident artists that make the Art Center a vital part of Georgetown. Artists will have original work for sale and be present to answer questions about process and inspiration. 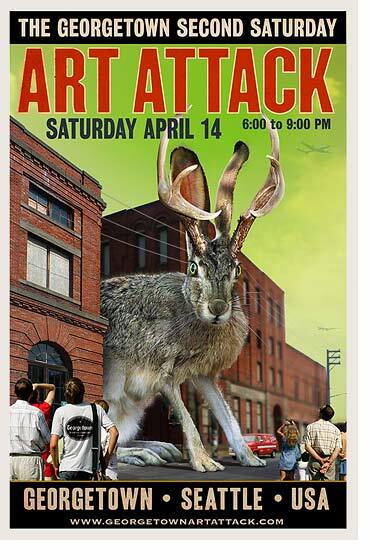 Georgetown Atelier hosts Draw Attack! !, a life drawing session with a costumed medieval damsel, and musical accompaniment by Jordan Corbin Wentworth of Watershed Opera. Student art on display. Georgetown Trailer Park Mall, Big One Eyed Cat and Trailer Park Cinema present NIGHT OF THE LIVING ELVIS, a multimedia installation of terrifying proportions. 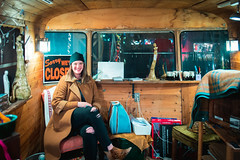 Visit an assortment of vintage trailer venues hosted by purveyors or the odd and unusual. Krab Jab Studio presents the whimsical prints of master printmaker Mirka Hokkanen, as well as new works by resident artist Milo Duke and artist-at-large Kyle Abernethy. The Nautilus Studio hosts Ian Ferger’s minimalist- machine age- copper- light boxes, and the stunning book art of Elisabeth B. Sheets. A show in the dark! Sage Artistry Studios kicks off “Camp Clay”, DIY art classes specializing in natural finishes. 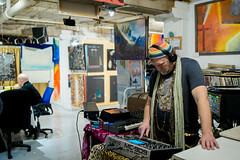 Vecta Photo will be featuring music in the studio. Sonic Revival: Ben Henry (from Grim Smiley) and Kite Repair. Ben Henry will be making his solo debut mixing ballads and acoustic rock. Kite Repair plays mischievous folk-rock combining cello, bass, guitar and drums in songs of misplaced hope and best intentions.